Hilarious scandal story from "Bones"
I posted recently about the spoof billboard created by Laurence England of That The Bones You Have Crushed May Thrill with the sensationalist news "Crackpot Priest Keeps God in Church Cupboard". 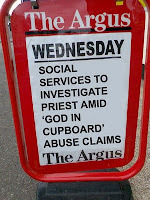 This has now been followed up with a loopily entertaining parody detailing the action of Brighton and Hove Social Services in response to this act neglect. It gets better all the way through with Ed Balls and the CES drafted in for comment. DCSF on teaching "divergent views"
"My life is in your hands"